Is Montessori just for gifted children? The Montessori approach allows each child to progress through the areas of the classroom at his or her own pace. Children are free to pursue their own interests, regardless of what other children may be doing. At the same time, if children need more support in an area, they can have as much time and opportunity to master skills without feeling like they have fallen behind. It is true that on either coast you will pay $20,000 to $30,000 a year for a Montessori preschool education. 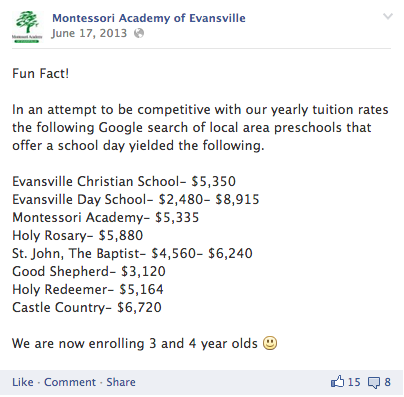 Here in Evansville, however, we fall in the middle range for private preschools. See our Facebook post on June 17, 2013 for price comparisons with other preschools. For current tuition rates, please click the “Tuition Information” at the top of our page. At Montessori, do the children run around and do whatever they want? Children’s freedom in the classroom is made possible through carefully planned grace and courtesy lessons, and simple yet regularly reinforced expectations of behavior. Children are allowed to make choices within this well-defined structure. During specified work time, children may choose work that interests them. Our goals are not just academic, but include teaching children how to think, reason and make choices. The classroom is a prepared environment where each choice has a developmental purpose. How do children transition to a traditional school? Our families report that the foundation laid during their children’s formative years at Montessori produce student who are well equipped for their continuing academic years, and beyond. You do not, however, have to take our word for it! Each year we hold a parent night forum in which former Montessori parents return to talk about their transition experience to other private and public schools, and current and interested Montessori parents are invited to ask questions.